Nashville, TN --- May 20th marks the release of Nighthawk, the new album from Danny Roberts. With The Grascals, Danny was a member of Dolly Parton’s band . He has recorded with George Jones, Hank Williams Jr., Dolly, Dierks Bentley, Charlie Daniels, Joe Diffie, Aaron Tippin, Steven Segal, and Elizabeth Cook. Some of the biggest names in music have collaborated on Grascals’ projects including The Oak Ridge Boys, Tom T. Hall, Brad Paisley, Vince Gill, Steve Wariner, Joe Nichols and Daryl Worley and The Jordanaires. Roberts has performed at top venues such as The Grand Ole Opry, the historic Ryman Auditorium, the White House, Radio City Music Hall, and various arenas and theaters throughout the USA and Canada. He’s also toured in Japan, Greece, France,Norway, Switzerland, Belgium, Germany, and Denmark. His TV appearances include The Tonight Show with Jay Leno, The Late, Late Show with Craig Ferguson, The Talk, The Marie (Osmond) Show, Fox & Friends, and Good Morning America (with Dolly Parton). The Nighthawk line-up includes Kristin Scott Benson and Adam Haynes of the Grascals, Tim Surrett of Balsam Range, Tony Wray of Blue Mafia, and special guests include Ronnie McCoury, Sam Bush, Aubrey Haney, Mike Compton, Jimmy Mattingly and vocal appearances by Danny’s daughter Jaelee and his wife Andrea. Danny Roberts will join Kyle Cantrell for an exclusive Track-By-Track of Danny's solo recording "Nighthawk" on SiriusXM's Bluegrass Junction airing Wednesday, October 8 at 11:00 am ET! Bluegrass Junction's Track-By-Track is also available on SiriusXM's "On Demand". Ten years ago, I reviewed Danny Roberts’ first solo recording, Mandolin Orchard, giving it solid marks. Now comes Nighthawk, a step up all across the board. Begin with the sound quality improvements. If you remember his first, you’ll notice this immediately. This is much clearer, much more sonically pleasing. That in itself goes a long way, but then there is the addition of three vocals numbers. Roberts could have easily followed the all-instrumental format of his first, but having his daughter, Jaelee, sing a gorgeous “How Great Thou Art” and belt out stunningly “Oh, Atlanta,” and having his wife, Andrea, lead a stirring “I Went Down A Begger,” lends a welcome variety. Which brings us to Roberts’ compositional skills and what is the most important change. While his first recording had solid originals, varied in style and certainly well-played, they rarely approached in interest or tunefulness the album’s lone cover, “Bonaparte’s Retreat.” Here, that has been largely corrected, beginning with the Monroe-sounding, bluesy stomp of “New Gil Ramble,” featuring a sparkling triplet-laced solo from Ronnie McCoury. Also Monroe-influenced, albeit tempered with some modern rhythmic punctuations, is “Nighthawk,” which includes some ear-catching note slides from Roberts and the expert mandolin and sinuous fiddle of Sam Bush. Then comes the ultra-fast “Big Stone Gap” in the breakdown tradition and later the Celtic Reel and bounce of “Coppinger’s Court” and, later still, a bluesy stroll with guest Mike Compton on “Walking To Winslow.” Woven among them are the antique/jazzy blending of “F-5 Rag,” the light mandolin/banjo duet of “Danielle’s Waltz,” the rip and twist of both “You’ll Have That” and “Derrington Drive,” and the surprisingly-noted melody of my favorite, “Swing-A-Long.” Not a one will fail to intrigue or impress or, for that matter, surprise. When it comes to live appearances, Danny Roberts is in danger of being overshadowed by his teenaged daughter, Jaelee, and he’s not complaining. I recently saw her on the Bean Blossom stage and the girl can sing! She sings the lead on the Alison Krauss hit “Oh, Atlanta.” You can hear the youthfulness in her voice but she owns the song. If she chooses a career in music she’ll be a powerhouse (she’s also a fiddler). She also sings lead on “How Great Thou Art,” a softer approach but with as much vocal control and presence as her other track. Oh, yeah, Danny Roberts. He’s a founding member of the Grascals and this is a solo mandolin project for him. He’s enlisted a fine crew of musicians to help, including bandmates Kristin Scott Benson (banjo) and Adam Haynes (fiddle), Tim Surrett (bass), Aubrey Haynie (fiddle), Jimmy Mattingly (fiddle), Ronnie McCoury (mandolin), Tony Wray (guitar) and Sam Bush(mandolin and fiddle). Good picking? Do you need to ask? Along with a majority of tracks on this projects, Roberts composed the title number, a medium-speed instrumental with some intricate parts and interesting progressions. “F-5 Rag” is a bit plainer but still a good number, featuring an extended guitar break by Wray. “Danielle’s Waltz” is a change of pace, just Roberts and Benson switching leads while the other plays a contrasting backup. “Big Stone Gap” moves at a speed that will tear off your hairpiece and features a nice break by fiddler Mattingly. “New Gil Ramble” has a fitting name as the tune seems to lope along at an easy pace, just like someone off on a ramble. It features an interesting section with Benson (banjo) and Wray (guitar) trading phrases. “Walking To Winslow” has the same easygoing feel and again has the Benson-Wray trading of licks. Both feature a second mandolinist (McCoury /Mike Compton) and, if you listen close, you can hear some spots where they trade licks with Roberts. “I Went Down a Beggar” is a much-recorded gospel number that features spouse Andrea Roberts (lead) and daughter Jaelee (harmony). They blend well and do an excellent job on this good old number. The other cuts are “Derrington Drive,” another hard driving, fast moving tune; “Coppingers Court” is a lilting, reel-like number with a section played in a minor key; “You’ll Have That” is a medium speed, danceable number. “Swing-A-Long” is a change of pace from all the other numbers, a bit of swing as the name implies. If you like instrumental packages you’ll enjoy this CD. There’s variety and excellent musicianship. The bonus is a preview of a young singer who can make a name for herself in this business. 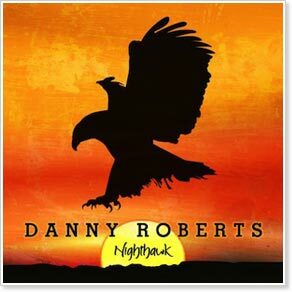 The Grascals founding member Danny Roberts is out with another outstanding solo recording entitledNighthawk, set for release May 20. On this project of mostly all-original material, Danny receives support from an all-star line-up that includes Tony Wray on guitar, Kristin Scott Benson on banjo, Tim Surrett on acoustic bass, Sam Bush on mandolin and fiddle, Mike Compton on mandolin, Ronnie McCoury on mandolin, Aubrey Haynie on fiddle, Jimmy Mattingly on fiddle, Adam Haynes on fiddle, Paul Harrigill on guitar and Dominic Illingworth on acoustic bass. Vocal support is provided by family members Jaelee and Adrea Roberts. About the projects Roberts said, "It was so much fun recording tunes that I have written accompanied by such outstanding musicians. I'm very excited about the special guests that came in to record with me and I am truly honored to have them be part of this."